The family that zaps together stays healthy together. And that includes our dear dog, Cosmo. We all know how many parasites our pets can bring into the home. Taking care of the littlest ones in our family is the secret to keeping everyone healthy in the household. One way to zap our furry family members is to hold the copper handles up against our pet’s skin, getting the fur out of the way. Cosmo has pits that have very little fur, so I put the copper handles there. For other pets, it may be their belly area. Just find spots that will make the most contact with the copper handles. The second, more effective, way to zap pets is by setting up a Zappicator. A Zappicator is created by the combination of a Hulda Clark Zapper set to 1 kHz connected to a North Pole Speaker. I set up the North Pole Speaker Box under Cosmo’s bed and he can relax while zapping. 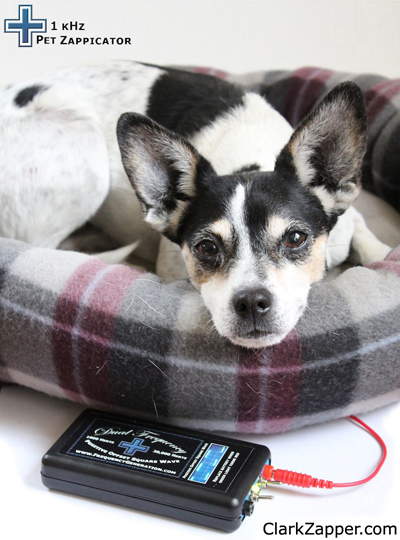 He loves to relax with our Hulda Clark Zapper. 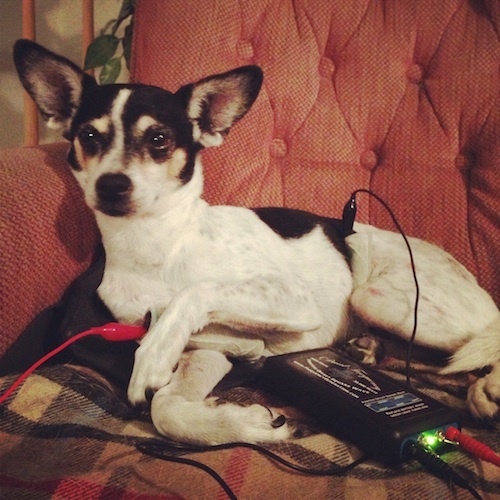 Click for more information about the Pet Zappicator.